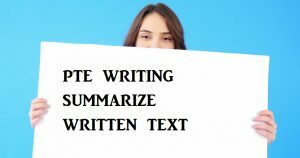 Summarize written text carries more points(my assumption based on my experience), Try to cover the main point and write 30-35 words using COMMA and connecting words like hence, so, because, however, but, instead … etc. Only one FULLSTOP should be used at the end and start the sentence with capital letter. – 0 Not written in one, single, the complete sentence or contains fewer than 5 or more than 75 words. PTE Summary is written in capital letters. – If you read carefully how the PTE Academic scoring engine evaluates your written text, much of the doubts would be clear to you and with this new set of to-do, you think that you can achieve 90/90. – Well, one can but I would tell some more tips which will really help one even if his/her vocab and grammar is not very strong. 90/90 is only possible with strong vocab and grammar. However, you can expect 73+ with average vocab and grammar with below tips. – It says between 5 – 75 words but try to write between 35–45 words. A too long sentence is not generally grammatically correct. Even if it’s correct, PTE scoring algorithms are not programmed to evaluate long sentences correctly. – Pretty obvious however pay attention to the fact that you use only full stop/period and that too at the end of the sentence. – Do capitalize the starting words and nouns (Names) in the sentence. – Don’t provide any examples, reasons, and illustrations, whatsoever. – Write the summary in third person form. Don’t use I, We… etc. – Generally, most of the summary of the answer is in the last paragraph so concentrate on it. – Also, try to summarize each para first later concentrate on it and make it a single sentence. Practice these summarize written text strategies and tips. People appeared in PTE exam can share their experience, suggestions & tips in the comment section below. Please Like & Share with other PTE aspirants.